Contract of Services (COS), Job Orders (JO) and project-based (PB) workers in the government will have a merrier Christmas this year. This is after President Rodrigo Duterte approves the recommendation of Department of Social Welfare and Development (DSWD) to give a cash gift to these employees worth P2,000 each. 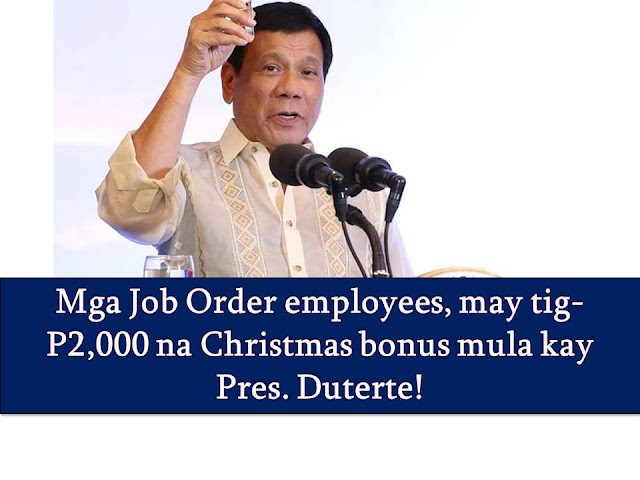 Accordingly, this is a 'modest Christmas gift' of the president to the said workers as a way of recognizing their contribution and efforts in public service. Base on the guidelines of Civil Service Commission, only regular and casual plantilla workers are entitled to bonuses from the government such as 13th and 14th-month pay. Even Department of Agriculture (DA) Secretary Manny Piñol shares the good news on his Facebook page. “President Duterte agreed that JO, COS and PB workers should be given a cash gift for them to share with their families on Christmas,” said Piñol. The original recommendation of DSWD Secretary Judie Taguiwalo is P10,000 incentive per worker but Budget Secretary Benjamin Diokno explained that the government will be needing an estimated P3.5 billion additional budget for the said bonus.